Spacious three-bedroom,two-bathroom vacation home for up to seven guests. 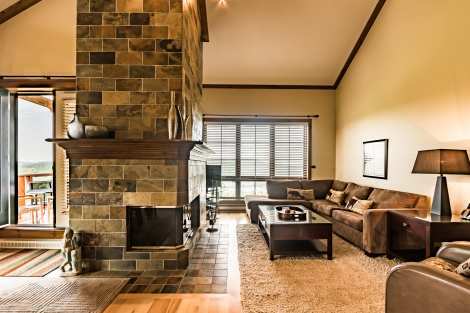 Featuring an abundance of windows, the elegant and sunny unit offers a panoramic view of the lake and rolling valleys. The living room is a great place to relax, with an imposing wood-burning fireplace and large comfy sofa. The well-equipped kitchen has a bar-style counter for chatting with the others and having drinks while preparing tasty dishes. A large dining table has plenty of space for everyone to gather fora quick, hearty breakfast before heading out for the slopes or a gourmet meal at the end of the day. The three bedrooms are inviting and the bathrooms are luxurious. The tile floors are heated and the furniture is comfortable. High-speed internet is included. Every detail has been considered to ensure a perfect stay.